Have you ever considered starting your own business? How about leaving your job to pursue your passions? As I mentioned in last week’s blog post, I did just that in January 2017, and its been one of the biggest transitions of my life. Today, I’ll be sharing with you my entrepreneurial journey. The funny thing is that I never thought I’d be an entrepreneur. It just seemed too daunting, and I didn’t think I had the personality or temperament for it. The stress and uncertainty are a lot to handle, especially those of us who thrive on certainty and routine. While I’ve had some incredible entrepreneurial role models, I never saw myself following in their footsteps. Instead, I saw myself as an employee, working for large companies with job security and a clear path to retirement. My career, however, didn’t exactly start off perfectly. A short five months into my first job after University, I had a rude awakening. It was the Fall of 2008 and my company was hurting from the recession. They were cutting jobs, including mine. As I mentioned in a video about my experience, while challenging, it caused me to dig deep and persevere. Ultimately, I landed a fantastic job at a great company where I worked for the next three and a half years. I never, however, forgot the lesson I learned that job security isn’t a guarantee. This planted a seed in my mind around the importance of having a solid emergency fund and a back-up plan. Subconsciously, it probably also primed me to pursue multiple streams of income down the road. I got my first taste of a passion project when I started a beauty blog in March 2012. Plainly named “Kate’s Beauty Blog”, I poured my passion for makeup, skincare, haircare, and other beauty products through reviews, features, and tutorials. I was so passionate about it that I posted every single day, and found no shortage of topics to write about. Blogging was the perfect way to express myself, pursue a hobby, and become active in a community of other beauty lovers. I made blogging friends, grew my reach, and even got to work with a few of my favourite brands. I could hardly believe that companies wanted to send lil’ ol’ me a dry shampoo for FREE. It was a beauty lover’s dream! It was awesome. I felt so engaged and inspired, often not falling asleep until the early hours of the morning, caught up in brainstorming new post ideas or thinking of new tutorials. I hadn’t felt this excited about a project in years. Unfortunately, as time went on, I had to face some challenges, the first one being a waning interest in beauty products. While it was a keen interest of mine at a time, like many hobbies, it waxed and waned and there were months at a time where I felt I had nothing to write about. I would instead write “inner beauty”-themed posts that, while tucked under the beauty umbrella, didn’t really align with my blog. I rebranded to “Kate Lauren Style” (Lauren is my middle name), hoping that it would let me expand into more of a “lifestyle” focus and broaden what I could write about. After a while, though, I realized that the name was probably confusing, since “style” implies fashion which was only a small segment of what my blog covered. Back to the drawing board I went, rebranding to “Kate Lauren” and choosing to post within three pillars: work, life, and style. Under Kate Lauren, I launched a YouTube channel in December 2014. I had no shortage of ideas, and I posted videos twice a week with accompanying blog posts. I was able to talk about whatever I was interested in at the time, and to choose between video and blog post depending on the topic. Video felt more personal and really helped me connect with viewers, while blog posts were perfect for sharing more details and resources. About six months in, I had found a pretty solid groove, but it wasn’t enough. As an achievement-oriented person, I wanted to see results. If I was pouring myself into this, why wasn’t I seeing the growth I had expected? Why were my subscriber counts so low? Was it crazy to keep investing so much more money into my blog and channel with pretty much zero return? Why were some of my closest friends not even watching my videos or reading my blog posts? Looking back now, I empathize with the pain I felt. It was more than feeling like a project of mine was being rejected. Instead, I felt like I was being rejected. I took the “poor results” personally, not able to take a step back and look at things more objectively. I felt I had dared greatly and felt rejected for being myself, living in accordance with my values, and doing something that mattered to me. Around the same time, I bought an Erin Condren Life Planner and became really involved in decorative and functional planning. For those of you aren’t familiar with the planning niche, it involves using a planner as somewhat of a scrapbook or memory book, adding stickers and washi tape to create beautiful themed weekly spreads. It’s part organization, part creativity, and a whole lot of fun. I had always used a physical planner to keep myself organized, and being able to use it as a creative outlet was right up my alley. I loved the weekly ritual of planning out my days and adding stickers and decoration to express my creativity. Given planning is an ongoing hobby, I found myself spending a lot of money on planner stickers. They seemed to be pretty easy to make with the right software and equipment, so I decided to make my own, and in October 2015 I launched my own shop on Etsy: Kate Lauren Design. (For those of you unfamiliar with Etsy, it’s an online marketplace for vintage items, handmade goods, and craft supplies). I loved it. From finding suppliers and pricing my products, to interacting with customers, running my Etsy shop let me put my business experience into action. I was also amazed at how quickly it grew. I sold over 100 orders in my first three months of business, despite only focusing on my shop part-time. It was incredibly validating, especially after feeling so dejected from my blog and channel. I couldn’t believe something I started on a whim was actually turning into a stream of income. I found myself in an interesting situation. Here I was with two small businesses: one that was emotionally charged with high risk, high expense, and low return; and another that was fun, low risk, and with early financial upside. It’s really no wonder I let my blog and channel slide and focused on growing my Etsy shop. After a few months of solid work, I had my first $1,000 sales month in January 2016. It felt strange that the arguably “easier” and less bold business was successful so soon, but I wasn’t complaining. I continued to focus on my Etsy shop in my spare time. I designed stickers on weekends, fulfilled orders every night after work, and dropped them in the mailbox on my way to the office. Every penny of my Etsy revenue went into a separate account and didn’t touch it. I saw it as a side hustle that was pure gravy. During this time, I posted on my blog and channel occasionally and rebranded, yet again, to Fun & Fulfilled. It felt aligned with my vision of focusing more on personal growth-related topics (fulfilled), with the permission to touch on some of the lighter areas (fun). The business was often at the back of my mind, but I still didn’t have the capacity to focus on it more, nor the financial justification to do so. Months passed, and in the Summer of 2016, I became antsy. My grandfather passed away in June, and the experience led to a lot of reflection. I reflected on the importance of making time count. 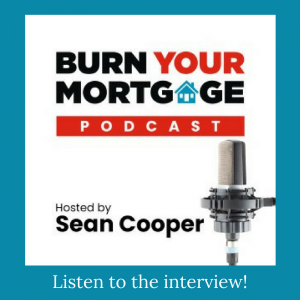 On the entrepreneur that he was, starting from extremely humble beginnings and working incredibly hard to grow a business from scratch and provide for his family. On how fulfillment, while at times risky, is something we should never stop pursuing. By the Holidays, this inner tension had reached a breaking point. I knew in my heart that I wanted to really give both Etsy and blogging a shot. And that I wouldn’t be able to do so without giving them substantially more time and attention. My initial plan was to wait several years to focus on them full-time. I figured that once I had a child I would have the time and freedom (ha!) of a year-long maternity leave to do so (thank you, Canada). But that was still a few years away and in the meantime, I was living my life feeling stuck. I was sharing only a fraction of myself with the world, and working in a job that brought me minimal fulfillment. At the start of January, several things seemed to click into place. Second, I realized that starting a business on maternity leave may not be as easy as I thought. I realized that when that time comes, I’ll likely already be tired and overwhelmed. I’ll also be learning a whole new set of skills. Adding to that the assignment of growing two businesses may not be setting myself up for success. Third, I changed how I viewed my financial situation. 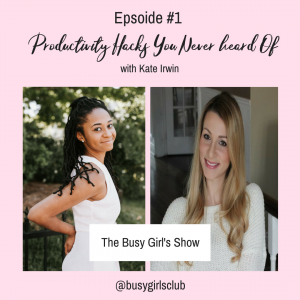 Instead of thinking I couldn’t leave my corporate job because I hadn’t yet replaced my full-time income, I realized that 1) it would be extremely challenging to grow my businesses to that level without additional time and effort; and 2) I didn’t even need to replace that income right away. 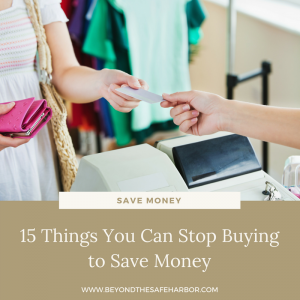 Through my side hustles (blogging, YouTube, GoRead, and Etsy), I had been earning enough to consistently cover my monthly expenses, and had enough of a savings buffer in case I needed to dip into it. I let those ideas sink in and went home to visit my parents to really think about the decision. I cried most of that weekend. While at the time I thought it was because I was crippled with the pressure of making what felt like the biggest decision of my life, it was probably partly mourning the loss of the corporate identity I had built for myself, and partly releasing the tension I had associated with taking a challenging path. After much reflection and asking myself some key questions, I decided I owed it to myself to give my passions a shot. While I was leaving my job to pursue my side hustles, resigning was still hard. I knew I’d miss my colleagues, certain projects, and the structure of a large company. I’d also miss the busy office environment, the stimulation of working on a team, and feeling like I was part of something bigger. Lastly, I knew I’d miss the certainty and security of a bi-weekly paycheque. After my resignation was announced, the team was incredibly supportive and excited for me, which I’m so grateful for. I had only been in my current role for 7 months, yet their sentiments were authentic. Many of them even said they wish they had done something similar when they were younger. Having a family now means that they have less flexibility to try their hand at entrepreneurship or self-employment. As I write this, it’s the start of September and I’ve been a full-time solopreneur for seven months. It’s been one of the most challenging chapters of my life, but also full of tremendous growth. I’ve learned a lot about myself, my strengths, and my habits. I’ve faced triumph and self-doubt, excitement and stress, joy and loss. During these seven months, I’ve also gotten engaged and bought a house. Needless to say, it’s been a crazy year. And I have no doubt that the next six months will be full of more change and learning. 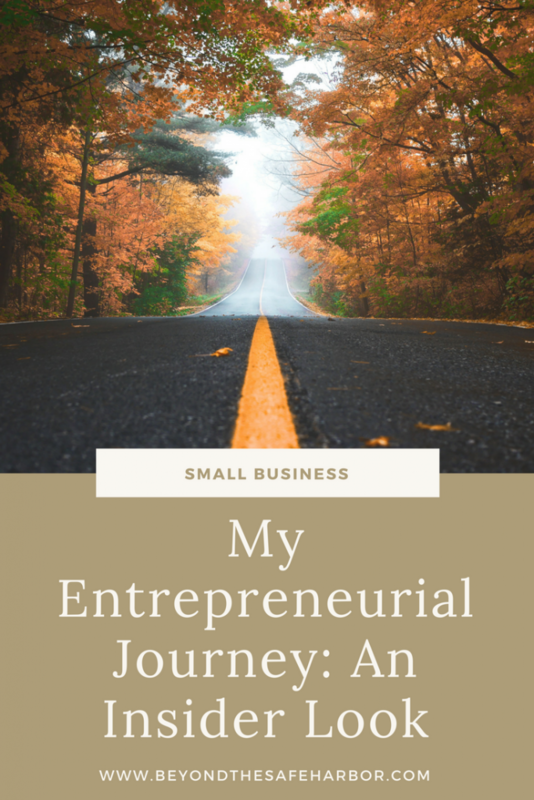 I’ll be sharing some of my reflections on new entrepreneurship in a future post, and I’ve also drafted posts around getting started on Etsy if you too are looking to build additional income and maybe even leave your day job. In the meantime, I would love to hear from you: Have you considered leaving your job to pursue your passion? Have you considered pursuing multiple streams of income? What are you most interested in learning about when it comes to starting your own business? Until then, thank you for reading about my journey and I’m looking forward to sharing more with you in the future! Check out my post The 5 Life-Changing Moments That Shaped My Journey for more life lessons and reflections. « Welcome to Beyond the Safe Harbor! I would LOVE to able to do what you did! Congrats for facing the fear and jumping into it. Unfortunately, with a toddler and a house, I’m just not financially in that place. Although my husband has graciously offered to work a part time job so that we could give it a go. I’m not convinced that it’s the best solution yet! It sounds like you’re in the right track and doing amazing. Best of luck! Thanks so much for your comment, Kira and the kind words! I totally hear you – there’s a lot of unknown and it’s hard to take the plunge when things aren’t fully aligned. Here’s hoping you get there quickly, and let me know if there’s any way I can help! I’m always looking for new topics to cover or questions to answer for people looking to take a similar path. Thanks again – your words made my day!